The UK Department for Transport’s airing it’s THINK! 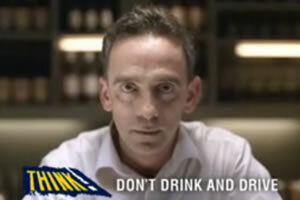 drink drive advert again. It’s good, but is it focusing on the right area?. The ad (playable below) is a great example of collapsing consequences of an action into a compressed time frame. Great because we tend to ‘push off’ consideration of events construed in a distal dimension, and the perception of drink driving events are distal in all four dimensions; not (likely to be) me, not (likely to be) here, not now (the consequences of being caught), and not clear (exactly what the penalty is). We talked about Charles K Atkin’s ‘Mass Communication Effects on Drinking and Driving’ before in relation to norms and perception (Mirror mirror in the wall). We know that drink drivers overestimate the statistical risks of both crashes and police stops. They do this by quite a bit (perception of 1:100 versus reality of 1:2000). So the perception of being caught is already thought – incorrectly – to be high. Making an ad, and the consequences described, seem more likely equals shifting a perception that already starts out in non-drink driving’s favour. We’re pushing at an open door. Is there any other aspect of drink driving that could have a greater effect? Social approval might help. It’s skewed the wrong way. Generally we underestimate disapproval; perceived behaviour is different to the actual average behaviour. Using overt communication, such as TV ads, we could ‘pick at that scab’ with the possibility of changing behaviour more fully. THINK! provides road safety information for road users. Our aim is to encourage safer behaviour to reduce the number of people killed and injured on our roads every year. For more information visit the website. Taking a social angle seems to make sense – so I'd go all-out on an ad in the style of Google's 'life stories' type of ads. A social timeline showing tweets, status updates, and photos of a group of friends on a night out, beer in hand (assuming that's allowed under advertising regulations), followed by an abrupt switch to RIP messages etc. Social networks offer the perfect context for discussing socially motivated issues, target the young – who are still likely to be easiest to achieve long-term change in the way they think – and are relevant. And of course, there are the parallels with Ryan Dunn of Jackass fame, which help to demonstrate that it's a real-world issue and not just another government warning about a marginal risk. I think you missed the point Bobble. Atkin's research tells us that social disapproval is the quasi-stationary perception that has a larger gap to reality than the gap between the perception and reality of getting caught/hurt. So the content of comms needs to be about social disapproval of drink-driving, not about the effects of drink driving delivered over social media – Google-style soc media chats cutting to RIP messages is an executional tactic based on the getting caught/hurt perception that uses social media as its carrier. This is not the conclusion I proposed. To use the tactic you described to evoke the conclusion I proposed, one could use Goggle-style soc media chats that discussed the disapproval of a friend who was drink-driving. I'm not sure how compelling this would be, to be honest (and I would want to see alternative solutions), but evoking social disapproval in paid-for media space is the job of creatives –&nbsp;they can solve that in whatever way they see fit.